An advance health care directive to avoid prolonging late-stage dementia has been developed by End of Life Choices New York. The Advance Directive for Receiving Oral Food and Fluids in the Event of Dementia was written with the help of physicians, palliative and hospice care experts, lawyers, and others with concerns about dementia care. This Advance Directive permits those who retain decision-making capacity to document specific choices about future assisted oral feeding in the event they develop an advanced stage of dementia. The Directive will be of use for those in the earliest stages of dementia as well as those who fear a future diagnosis due to a significant family history of the disease. EOLCNY has developed the advance directive in response to growing demand for clear language to address specific needs not adequately covered by health care proxies and living wills. The directive for receiving assisted oral feedings has two options: Option A refuses all oral assisted feedings once the patient is in an advanced stage of dementia and the ability to self-feed and make decisions has been lost. Option B permits assisted oral feeding in advanced dementia but limits that comfort-focused feeding that must be stopped when the patient becomes disinterested or unwilling to be fed. Without an advance directive most individuals with advanced dementia are spoon fed, often for months or years. Only when patients begin to cough and aspirate liquids into their lungs are efforts to provide assisted oral feedings stopped. EOLCNY developed this advance directive to provide clear documentation that the patient decided, while still mentally capable, to refuse all life prolonging measures, including assisted oral feedings, once their dementia became advanced. EOLCNY recommends that their new advance directive be used together with other forms of advance directives such as a health care proxy and, if appropriate, a MOLST form (Medical Orders for Life Sustaining Treatment). EOLCNY strongly advises open discussion of these personal decisions with the family attorney, loved ones, medical care providers and caregivers. By bringing forward the issue of feeding in dementia the advance directive seeks to clarify a critical issue in end of life care, a frequent point of debate and anxiety. EOLCNY welcomes a broader discussion, including judicial review, of options to expand choice for people as they encounter challenges in the end stages of life. End of Life Choices New York is a nonprofit organization working to improve end of life care so that people can have a good quality of life in their final months and a peaceful death. It educates health care professionals, students, and the general public about end of life options; provides one on one counseling to patients and, andlies; and advocates to get laws passed in New York State to improve end of life care. End of Life Choices New York can be reached by telephone at 212 726-2010 or info@endoflifechoicesny.org. 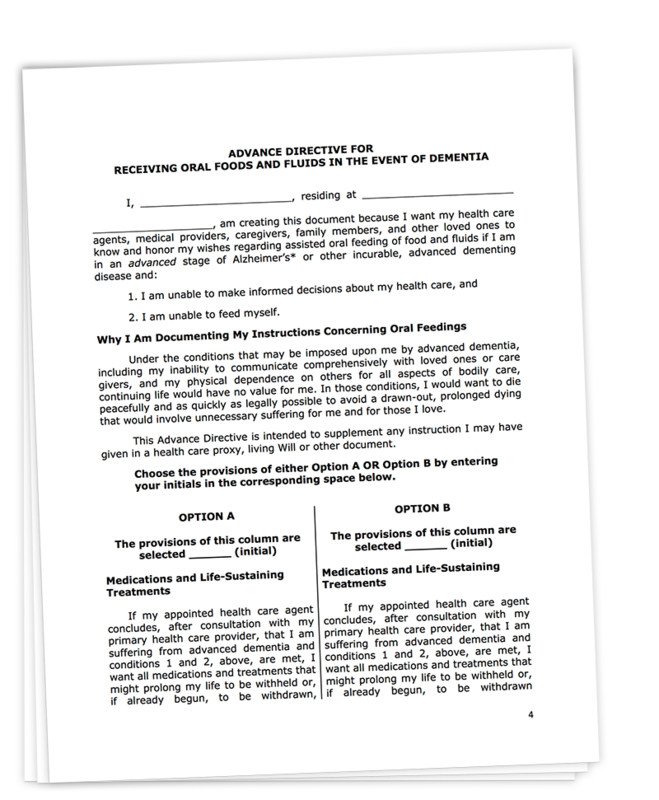 The Advance Directive for Receiving Oral Food and Fluids in the Event of Dementia is available online: endoflifechoicesny.org . For media inquiries, contact Tom Dunn, EDCommNY@gmail.com, 518-331-6097.